The Havahart 1085 trap is designed for catching Raccoons, Feral/Stray Cats, Woodchucks/Groundhogs & Armadillos & other similar size animals. Designed for the needs of homeowners and gardeners to capture and relocate pests without harming them. One spring loaded door, solid top, and an easy setting method. This humane trap is the Safest, Easiest live animal cage trap on the market. A revolutionary design with a new set and release mechanism that allows the trap to be set with one hand and limits interaction with the animal. The interior of this trap is made with smooth edges that protect and prevent injuries to the caught animal. 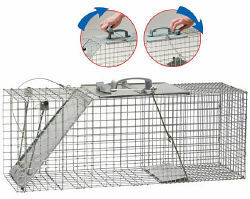 Ensuring the safety of the user during transportation of the animal is also important, and this trap has a solid door and handle guards to do just that. These traps are made in the U.S.A. Trap sets in two easy steps, see instructions below. Closed door dimensions 32 x 12 x 14"